You know how much I love getting in the kitchen with my girls. 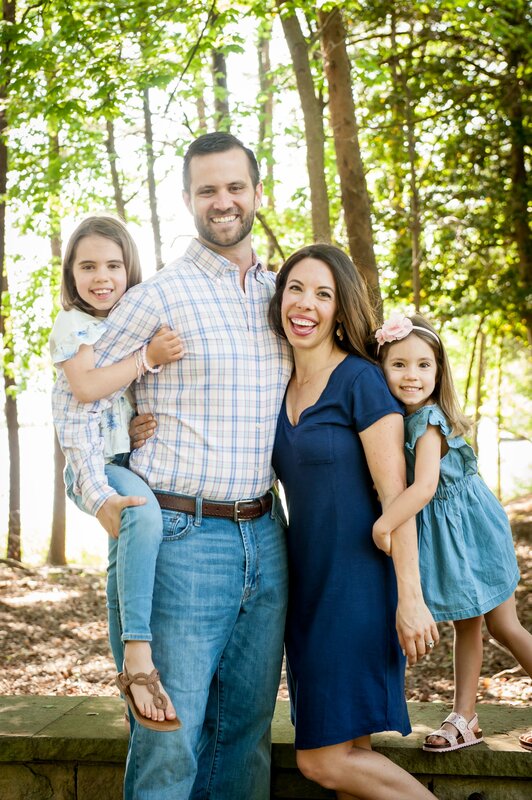 There are so many ways to get kids involved from a young age and I wanted to share a few of my favorite ways my three-year-old joins in on the fun! 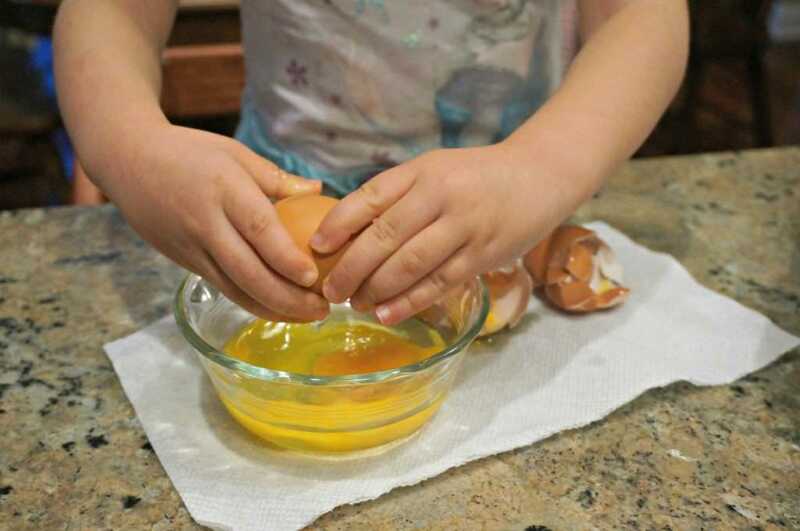 It’s easier than you might think to let the kids get involved in the kitchen! 1. Pulling leaves off of herbs or kale. This task is super safe and can keep them busy for quite a while. Hailey also enjoys this one because we smell the leaves, taste them and she guesses which herbs they are, which turns it into a game as well. 2. Using the salad spinner. This one is great starting at a toddler age. Now Hailey can rinse the leaves, shake them out and spin them. Watching it fly around in circles is always a hit. I know raw chicken isn’t what you’d think of letting kids play with, but if you prepare it and have it wrapped in wax paper or plastic, it’s a lot of fun to let your child take a few swings with the mallet. 4. Using the garlic press for things other than garlic. The garlic press is a really fun kitchen tool, though squeezing garlic can take some real hand strength, so I recommend this easy-to-squeeze garlic press. We also have this creative version, perfect for letting her transform avocado or fresh mozzarella into “worms” that are easy to create and fun to eat. This one might have a bit of a learning curve, but I’m impressed at how well Hailey can now crack an egg. It’s one of her favorite kitchen tasks. Whenever we make pizza dough, I break some off and let Hailey go crazy with it. Playing with dough is great for developing hand strength, but it’s also fun to see what shapes she creates. Whatever she comes up with, we bake it, and she gets a big kick out of it. The secret with this one is to give them a separate bowl. If you need a tsp of baking powder and let them measure over the main dry ingredient bowl, you’re bound to end up with a 1/2 cup. I let Hailey practice by measuring tablespoons of flour into her own bowl. For Christmas, Hailey received a set of Curious Chef knives. They are sharp enough to cut soft foods like banana, pears, avocados, etc, without posing a real risk of slicing a finger. This is one of my favorite learning tools! Hailey loves setting the temperature on the oven, pushing the blender buttons and setting the timer. I like that it helps her to recognize her numbers and understand how some of our appliances work. Plus, the loud noises that accompany most kitchen appliances always make her jump and laugh. 10. Wiping down the counters. Making a mess in the kitchen is great fun… if someone else cleans it up! I started having Hailey help clean to teach her a lesson about cleaning, but it turns out she loves it. I use these green cleaners so I feel good about letting her spray like crazy. 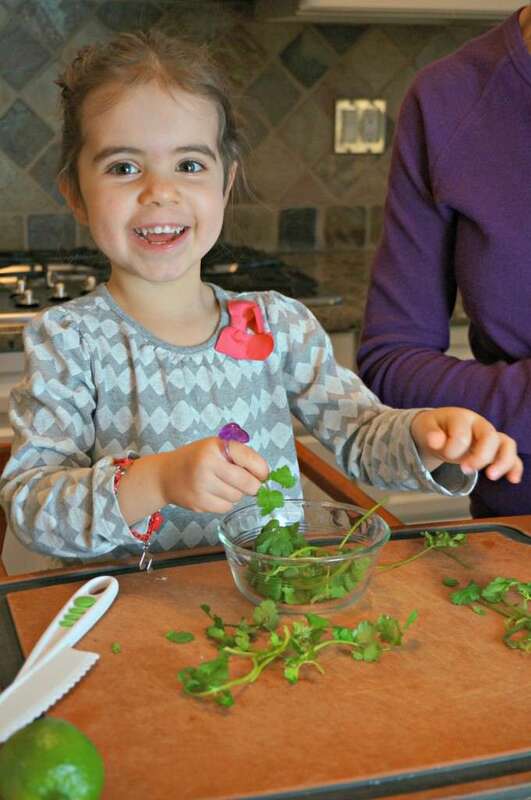 It’s never too young to get your #kidsinthekitchen! Here are 10 easy ways to get your #toddler involved! Basically I try to pull her in the kitchen with whatever I am making. She loves to help while tasting every single ingredient. I like the help (most days) and believe that having her hands in the mix does lead to her being more adventurous in trying new foods. Did you help out in the kitchen as a kid? Super pics of Mom’s little helper. What a cutie! John J. recently posted..Are Your Romantic, And Other, LIfe Expectations Being Met? I love that you bring her into the kitchen so often! Honestly, it one of my favourite memories from childhood! I absolutely loved helping my mom and grandma in the kitchen. It’s the little things but they really stand out years and years later! Taca @ A Side Of Dessert recently posted..Mexico Getaway Recap! I loved helping out my mom in the kitchen when I was younger, and honestly still do! Cooking with my mom is something that we still have in common as adults and it allows us to continue to bond as we live far from each other! Aw I love that! I have high hopes that in many (many) years down the road the girls and I will all get together in the kitchen at the holidays and cook with wine and music playing, just like I do with my mom! Her eyes light up like yours do when you are in the kitchen. I remember, on the rare snow days that we had, making homemade cinnamon rolls. The house smelled so good and they were delicious to eat right out of the oven! I can’t wait until Amelia is old enough to help in the kitchen! I think it will be so fun. We got about six inches overnight, so I think I’ll be strapping the babe to me and tromping around the neighborhood. It’s beautiful, but I sincerely hope this is the last of it for the winter. Now that’s a workout! And a fun one too 🙂 Enjoy and stay warm! 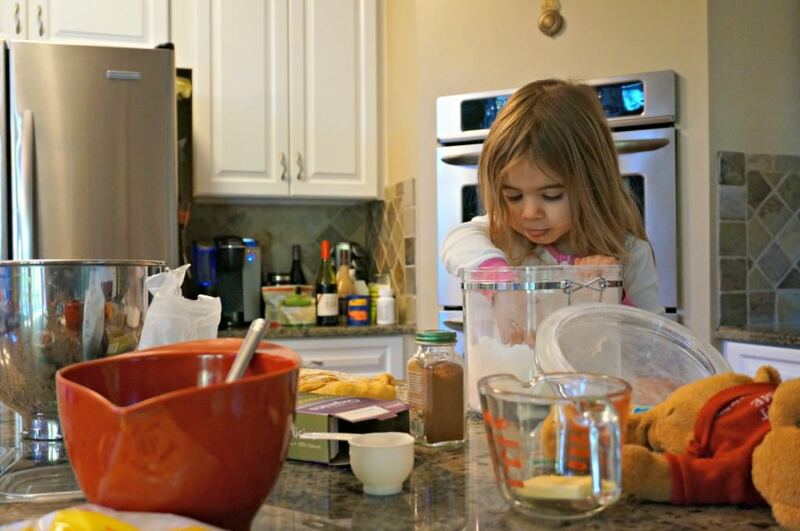 These are great ideas for encouraging interest in the kitchen at an early age– great post! Quick question: I noticed your food processor in one of the Hailey pictures. What kind/model do you have? Would you recommend it? I’m looking to invest in a good one. Thanks for any suggestions!! and it works well! For as often as I use a processor (which isn’t too often), it’s done a great job! I think mine was only $35ish at Bed Bath and Beyond a couple years ago- plus you can use the 20% coupon there! Great ideas! I love to have my three year old niece help me spread things like nut butters or put together lasagna or stuffed shells. 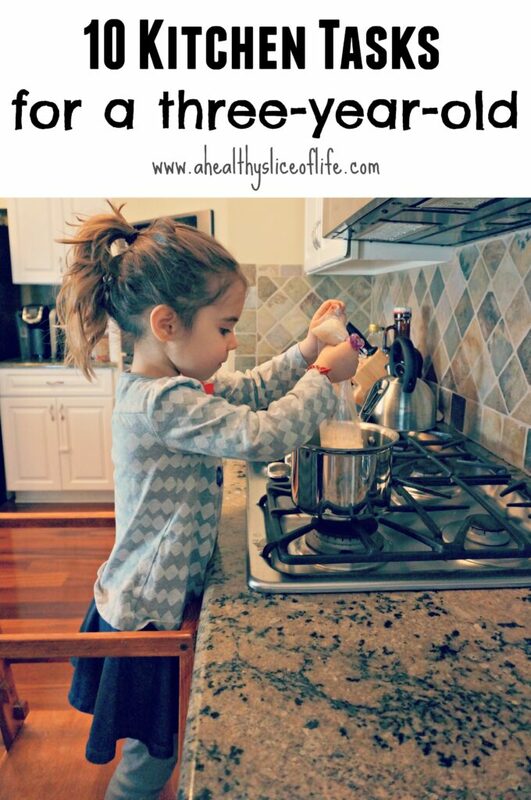 Great toddler cooking ideas! I’m so glad you were able to get Koda seen before the snow! Really great ideas! I know I should probably encourage my son more to try some of these. So far we’ve limited ourselves to mixing and pouring ingredients, but I have a feeling he’d love to get his hands on some eggs. Plus, how could I have forgotten the salad spinner! So much fun! Lately he’s been wanting to help clean, so he’s been helping me wipe up little spills and LOVES to help sweep and mop. Heather recently posted..I will never wash another bottle again. Great tips! Thank you for sharing! I let my girls play with a little flour and the measuring spoons the other day, total mess but they had so much fun! Maybe we’ll spend our snow day today baking and cooking some more things! She looks so happy! My 22 month old is fascinated my the kitchen. I let him mix a little bit, he loves it! Hi Brittany, do you ever just let Hailey veg out and watch a movie or a few Tv shows? I think it’s great she has a schedule packed with play dates/arts and crafts/cooking etc – just interested to know what your stance on TV was since I never hear it mentioned on here. Thanks! Hey Danielle! For sure Hailey watches TV. She loves Octonauts and anything Mickey Mouse. However, I do really try to limit it as much as I can. I prefer her to be playing, but also, her attitude gets worse when she watches TV. Great topic idea and I might write a post to elaborate on it, but she does watch TV, usually if I’m getting lunch ready or a show in the evening. Thanks for the question! My three-year-old (almost four year old) would love to help in the kitchen, and I think he would do great at many of the activities you’ve mentioned below. Now I just need to get him that very cool stepstool. Did your husband make that or did you buy that somewhere? David made it! He said it was pretty simple after I showed him the Learning Tower. We definitely use it enough to justify buying one if we needed to! Ah thanks, I checked out The Learning Tower and I can see the original source for your inspiration! I will have to see if my husband feels crafty enough to try and build one for us! i love this post! Hailey looks like she genuinely is excited to be in the kitchen with you! 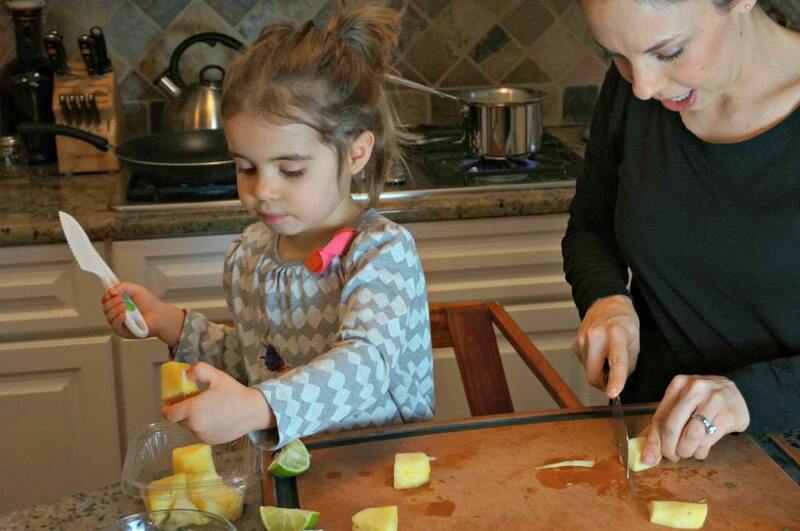 I definitely believe when kids have a hand in preparing the food they eat, they’re more likely to eat it and they’re creating healthy lifelong habits. My little girl loves cracking eggs too! More recently she has been creating “snacks” for me out of pantry ingredients though, lol. Things like dried fruit and nuts, she’ll put into little baggies and give them to my husband and I. I love it! Oh my this makes me want babies!! Love all of these and am going to share with my mom friends! Arianna who is three loves measuring out her porridge oats, putting in the saltanas and stirring. She also loves making banana smoothies putting the ingredients in the measuring cup and using the stick blender, she giggles at the noise. Also stirring hot chocolate made with raw cacao and coconut sugar and measuring muffin ingredients and spooning the mix into the patties. I will have to get some of those safe knives. Also I haven’t been brave enough to let her crack an egg, I’ll have to try. Oh and she likes putting the ingredients like veggies for fried rice or stir fry in the pan. She has a step to reach the stove. And I stay with her and hold the saucepan and always remind her the stove is hot and not to touch. She loves helping and always asks to. I love love love this! I don’t have any sweet babies yet, but I hope to soon. 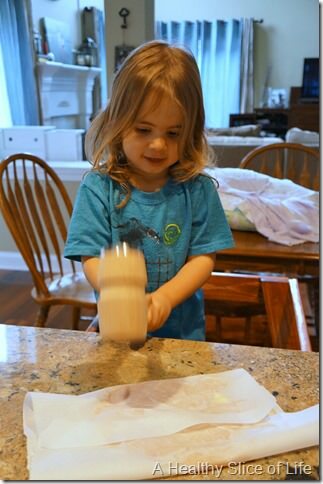 I love how you are teaching your daughter to help prepare food at such a young age! I love that Hailey is so adventurous with her eating! My first time even trying sushi was just a few months ago, and I am 18 years old! I spit out my water that I was drinking when you said your essentials were bacon and wine. You are hilarious, Brittany. Julia @ LordStillLovesMe recently posted..WIAW: Which Day Was Healthy?